TravelSkite: How's that again, Benedict? I was swimming back to the beach this morning when I passed a little blue penguin heading out to sea. I looked at him (possibly her), he (she) looked at me, we considered each other, and then we continued on our separate ways, the penguin waggling its tail, me not. It wasn't a total surprise: I, sad to say, found a dead little blue washed up on the beach a few weeks ago, on the face of it uninjured, and, asking around amongst the long-term residents was told that they nest under a couple of the baches (= holiday homes) in the bay. I had thought, though, that penguins were dawn/dusk creatures, so I was surprised to come across one active mid-morning. Then again, it was Sunday morning, and who doesn't like a lie-in at the end of the week? I have a short but pleasing history with penguins in the wild. The last ones I saw were down in the Catlins in the South Island, yellow-eyed ones. I watched them hopping remarkably nimbly, and remarkably far, up a hillside through the tussock and bush to their nesting holes in the late afternoon, as the low sun glazed with honeyed light the scattering of rocks beyond the lighthouse at Nugget Point. I had also seen them the previous day making their way across a petrified forest to their holes in the rocks at Curio Bay. To be honest, they're not the most appealing of penguins: small and cute from a distance, up close the yellow eyes are a bit off-putting, and I'd been far more entranced that afternoon by hanging out with the little Hector's dolphins at next-door Porpoise Bay. There were what used to be called fairy penguins on Kangaroo Island off the South Australia coast, before they got all butch and switched to calling them little penguins instead. I went on an evening penguin-spotting walk with red-light torches, and we did see them and hear them as they squawked and squabbled in their burrows, but in the dark it's harder to get excited about something you only see as a shape. I liked the pelicans better. 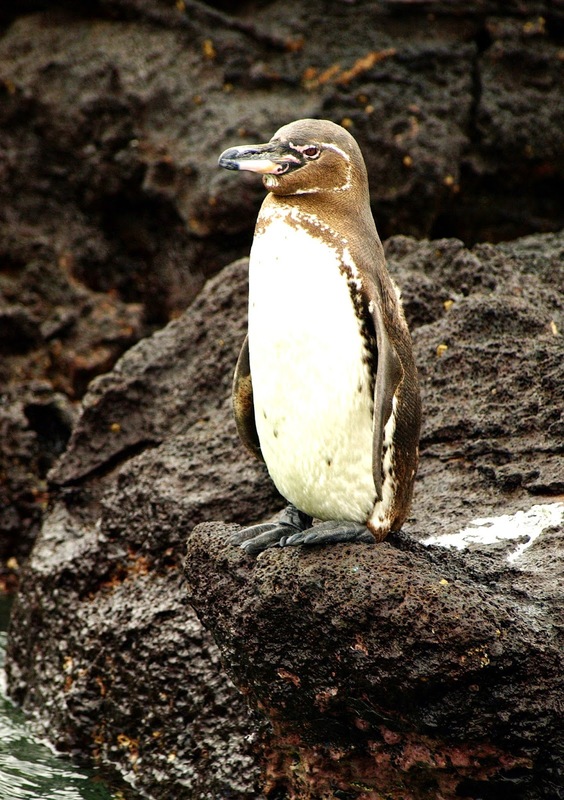 The most remarkable penguin I've ever seen (so far - one day, who knows, I may get to Antarctica and see the Emperors) is the Galapagos penguin, on one of the first islands I visited on my cruise there. It's the only one to live north of the Equator, despite all those Christmas cards you've seen with polar bears and penguins on them, and then only just, so they're literally tropical penguins. Galapagos is full of wildlife anomalies, so that's not as remarkable as it might otherwise be - but they still find life a bit difficult, and have to go scouting around for the cold Humboldt current, which swirls through the island group. They're small, too, and decked out in that classic penguin formal attire that's so very appealing. Cute. Though, according to the people here, if they live under your deck you have to put up with noise, smells, and fleas. Fleas!